Although I like cupcakes, I must confess that I’m not a huge fan of sugary frosting, I know, I think I’m the only one. So when thinking of this recipe I wanted to make a frosting that was sweet but not too sweet and I think the result was pretty much what I had in mind. 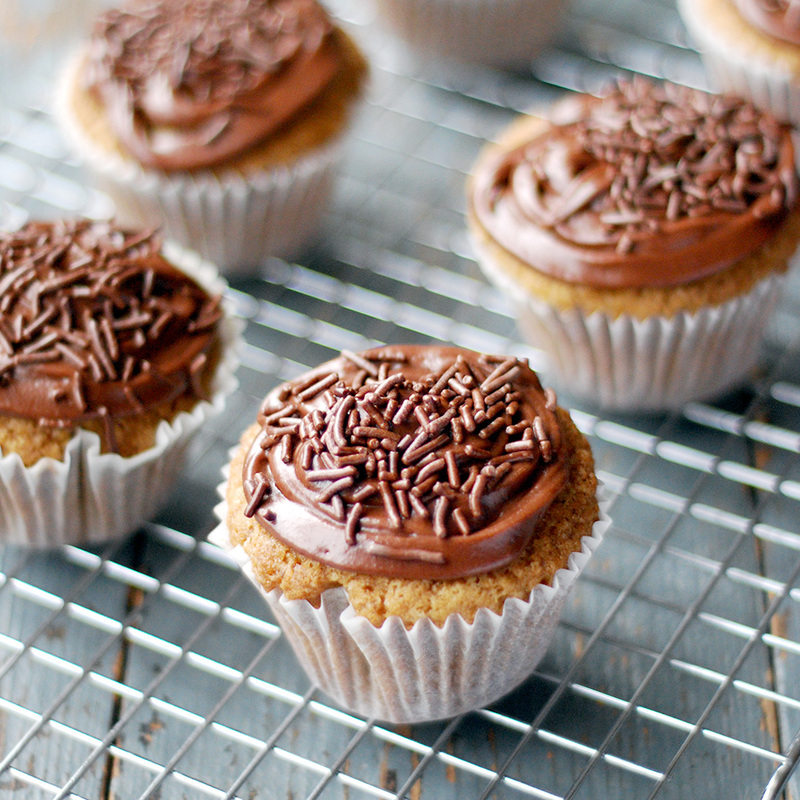 The cupcakes are as light as a feather and the chocolate frosting complements it perfectly. If you like cupcakes, this recipe is for you and if you don’t, it’s time you try this one, I can guarantee you’ll love it! In a medium bowl whisk together flour, sugar, baking soda, cinnamon, nutmeg and salt. In another bowl combine the almond mil, oil, vinegar and vanilla. Pour the wet mixture into the dry one and whisk until combined. Careful not to overmix it. Preheat the oven at 180c and line a 12 cupcakes ray with cupcake liners. Fill 2/3 of the cupcake lines with the batter and bake it for 12 minutes. Mix the all the ingredients until frosty and leave it the fridge for 1 hour. Place the frosting into your pipping bag. Pipe onto your cupcake and sprinkle the granulate chocolate on top of the cupcakes.